Despite spending most of her childhood in landlocked, rural New York state, Jillon is originally from Puget Sound, WA, which is where she began to love the ocean. 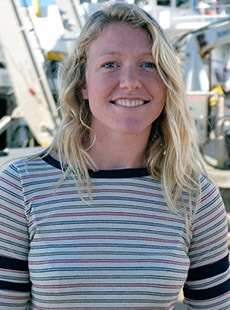 While earning a Bachelor of Science degree in marine biology from the University of Rhode Island, she got the research cruise bug during a Pelagic Ecology summer course aboard the R/V Endeavor. After graduating in 2015, Jillon continued to be involved with marine research and took as many opportunities to work at sea as possible. It was on these cruises that she realized she wanted to pursue a career as a marine technician instead of doing research. In 2017, Jillon enrolled in a 6-month Marine Systems program at IYRS School of Technology and Trades in Rhode Island where she developed the skills needed to install, repair, and maintain essential components on a boat including: electrical systems, plumbing, A/C and refrigeration, hydraulics, fuel, and Diesel engines. Jillon worked part-time as a marine technician on the R/V Endeavor at the Graduate School of Oceanography, URI after interning there in August. She left URI in November 2017 once she accepted a marine technician position at BIOS on the R/V Atlantic Explorer. Jillon and the other marine technicians are responsible for maintaining scientific equipment and lab spaces, the network, and navigation instrumentation, deck operations and safety, data acquisition, and acting as liaisons between the scientists and the ship’s crew.